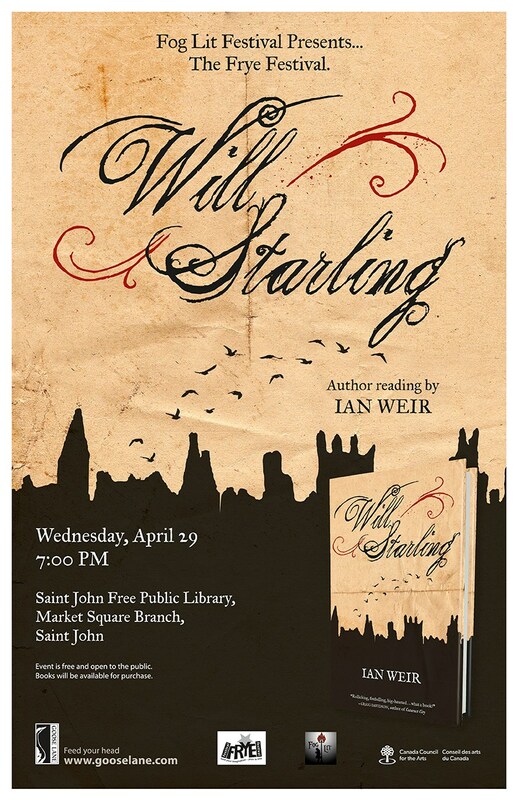 Join us at the Saint John Free Public Library (uptown at Market Square) from 6:30 PM – 8:30 PM for an evening with author Ian Weir reading from his latest novel, Will Starling. This reading is free and open to the public. Books will be available for purchase. Along the way, Ian has taken a variety of other literary excursions, including three young adult books, a syndicated newspaper humour column and the libretto for an alternative opera based on the legend of Faust. As for this novel-writing thing? He likes to think of it as a kind of mid-life Damascene conversion. His first novel, Daniel O’Thunder, was written in an intense nine-month outburst commencing midway through 2008, and drew upon tropes and notions that he had begun mulling a quarter-century earlier, as a graduate student tramping through the ancient winding streets of London. Published in 2009, Daniel O’Thunder startled its author considerably by being shortlisted for four awards, and left him with the fervent conviction that novel-writing is the most fulfilling creative voyage of all, and that he would very much like to undertake a few more of these. Will Starling will launch in Canada in September 2014, and in the US early next year. Ian lives in Langley, British Columbia with his wife Jude and their daughter Amy. When not anchored at a computer screen, he lives and dies with the BC Lions, roots forlornly for the Toronto Maple Leafs, and confesses to a guilty interest in boxing. He continues to think fondly of his old piano teacher.